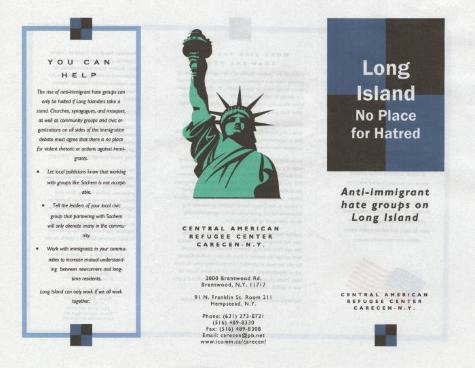 Central American Refugee Center (Carecen, N.Y.) flyer proclaiming "Long Island No Place for Hatred: Anti-Immigrant hate groups on Long Island" urging readers to take a stand in resisting anti-immigrant hate on Long Island, encouraging religious and community groups to speak out against violence towards immigrant groups, Hempstead, N.Y., ca. 2001. The flyer expressed concern over Sachem Quality of Life's (SQL) stance, labeling the SQL an "anti-immigrant hate group." Central American Refugee Center is a Hempstead and Brookwood, New York-based branch of the national organization. Source: Hofstra University.The Farmingville Collection, 1996-2005. Box 32, Folder 5.